Tigers are ferocious animals, as wild as it gets. If you think about getting a tiger to live at home, a usual advice will be to think that you will never be able to touch your tiger when it gets out of the cub age. And, for most cases, that is true. Trying to pet a tiger would typically mean severe injuries and sometimes death. Only sometimes it happens to be different. I was always amazed with the famous Tiger Temple in Thailand, where monks have tigers living between them. Now there is a family in Florida, USA, that does that too. They keep a couple of Bengal tigers in their back garden for several years, pet them and survive the experience. Read about it in the Daily Mail article. Posted on 2014-05-26 by Tigr. 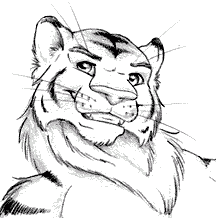 This entry was posted in Various and tagged animal, dangerous, en, pet, tiger. Bookmark the permalink.